" When the immune system of a dog is compromised, meaning that it doesn't properly fight off any mite infestation home remedies for dog ear mites are needed . Dog ear mites can cause itching, leaving a dog scratching, with head shakes and possible secondary ear infections. There are several ways to treat a dog with ear mites; most of them require a prescription from a veterinarian. Home remedies and natural preparations can be effective tools for treating canine ear mites. They are safe, do not require a prescription and are results oriented. " A mite infestation is a common problem faced by companion dogs. They cause severe ear and skin lesions, itching, scratching and discomfort. The occurrence of secondary skin and ear infections are possible. It should be noted that mites, specifically canine ear mites will usually infest a dog with a weakened immune system. Dog Ears are a normal habitat for different microorganisms. Some of these microorganisms are required to maintain ear health, but most of them are potential health risks. Once a dog’s immune system becomes deprived for any reason, these mites, bacteria and fungal components readily replicate and cause health issues. Almond or Olive Oil and Vitamin E: Almond or olive oil combined with Vitamin E is an effective option for treating dog ear mites. A half ounce of oil should be blended with 410 I.U of Vitamin E and then warmed to body temperature. 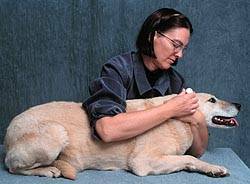 This preparation can be administered into a dog’s ear with the help of dropper. A few drops should be introduced into the ear canal. The ear should be thoroughly massaged and dog should be left alone when shaking on its own. The ears should be cleaned thoroughly with a cotton swab dipped in a quality mild antiseptic solution. Repeat the procedure and continued for at least six days. Mullein Oil, Garlic Oil and Olive Oil: Mullein and Garlic oil is another effective home remedy for treating dog ear mites. Equal parts of mullein oil and garlic oil should be thoroughly mixed (Half ounce each). 10 ml of olive oil should be added to this mixture. Warm the oil to body temperature. Introduce a few milliliters of this preparation into the ear canal and massage the ear. Keep this mixture in the dog’s ear for at least a couple of hours and then clean the ear with a clean cotton swab dipped in a quality mild antiseptic. Alcohol and Peroxide: Another home remedy for canine ear mites is comprised of alcohol and peroxide. A mixture of alcohol and hydrogen peroxide should be prepared in equal parts. A dog’s ear should be cleaned with a quality ear cleaner prior to the introduction of this mixture. 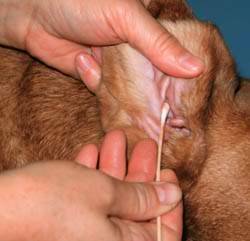 Dip a cotton swab or Q-Tip into the mixture and thoroughly clean the dog's ear canal. DO NOT go too deep into the ear as it can damage the ear drums. 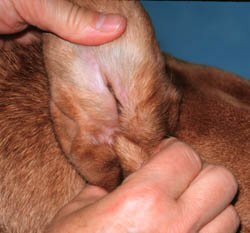 The inner portions of a dog’s ear are delicate tissues and sensitive, therefore the quantity of different components of any home remedy should be carefully calculated. Do not try to clean the deeper parts of the ear canal with cotton swabs and Q-Tips. They may cause irrecoverable damage to the dog’s ear and ear drums. A good rule of thumb is not not stick the tip of the Q-Tip further than you can see. If you can't see the tip, it is in too far. Home remedies containing oils should be warmed prior to use. Dogs with a severe mite infestation and with any problem noted after use of a dog ear mite home remedy should be immediately referred to veterinarian. To clean the ears, use an ear wash solution. Only apply a few drops of ear wash to the inside of the ear flap and tip the bottle into the ear canal. Do not insert the bottle more than a few millimeters to avoid damage to the ear. It is not unusual for the dog to try and shake the wash out as it is happening. Following the instructions from the manufacturer. Unfortunately, eggs and adult mites in the inner parts of the ear will remain untreated, thus the chances of a recurrence of any infestation are relatively high. Commercial natural remedies and herbal preparations such as Ear Dr. contain similar or like ingredients as those described for home remedies dog ear mites and is a preferred approach for treating dog ear mites at home. These are effective, easy to administer and do not require a prescription. A dog with a weakened immune system may also be helped by a natural remedy such as Skin and Coat Tonic, which maintains skin health and promotes immunity.